Yesterday a friend told me she knew someone about to go through chemotherapy for breast cancer. She asked me if I had any suggestions on what she could do or give to this friend to make her treatments a little easier. This isn’t the first time a friend has asked me for suggestions, and boy do I have some suggestions! So I thought I’d share what I’ve told others in the past because unfortunately, this won’t be the last time I hear about someone having to go through chemotherapy. Words in a card, words in person or over the phone, words on Facebook, words in an email…just some form of communication letting them know you are thinking of them can do wonders. A card may seem generic and “small” but everyone LOVES to get mail. When I would go to my mailbox and find a card addressed to me, it brought an immediate smile to my face. Do not underestimate the power of communication. Food brings people together. Families get together over meals. Families pray over meals. I think some of the best family conversations happen at mealtimes, so why not facilitate this time for a family to come together. Chemo is tiring and treatment day can be long (4-8 hours). Such a relief to come home and not have to worry about what’s for dinner. This is also a way to give to the entire family. Most likely a family member has been at the chemo treatment as well (in a not-so-comfortable waiting room-style chair, nonetheless). Or family members have to pick up extra responsibilities at home on the days following chemo because the patient is tired and can hardly get up out of bed, let alone pull together a meal. And if you can’t physically deliver a meal, consider a gift card to a local, favorite restaurant. I suggest disposable containers that are not expected to be returned. I can’t tell you how many containers I had on my dining room table with sticky notes reminding me of its owner! And meals that can be frozen and reheated for later are great ideas as well. Along those same lines, if you are helping coordinate meals, consider putting a cooler on the friend’s porch to help with deliveries when the family is not home, or just to keep from disturbing the family. And if you’re on the receiving end of all these meals? You may want to consider an extra refrigerator! A bag – Like an actual bag to put stuff in and carry to a chemo treatment. I had a dedicated “chemo bag” I’d bring with me to each treatment containing quite a few of the following things. Things to pass the time – Books, magazines, crossword puzzles, iTunes gift cards are all great ideas. If you know they will have a family member with them, maybe a book or magazine that would appeal to the family member. Things to keep them warm – This applies not just to the treatment room, but every day if the weather is cold, and especially if hair loss is a side effect. My chemo treatments were during the winter months and I was cold all the time once I lost my hair. So giving a hat, a scarf (which I would wear inside), cozy socks or a nice cozy blanket I think would be appreciated. Tissues – Why, you may ask? 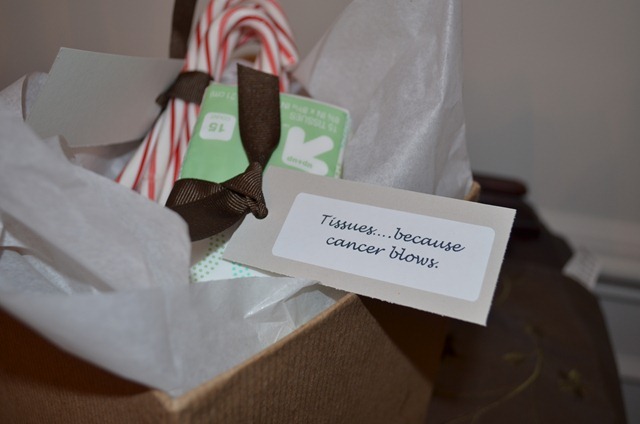 Well it is an emotional time, but the reason I’ve added travel tissues to chemo care packages in the past is because if the hair on your head falls out, most of your other hair is going to fall out as well, including nose hairs. And no nose hairs means a runny nose. 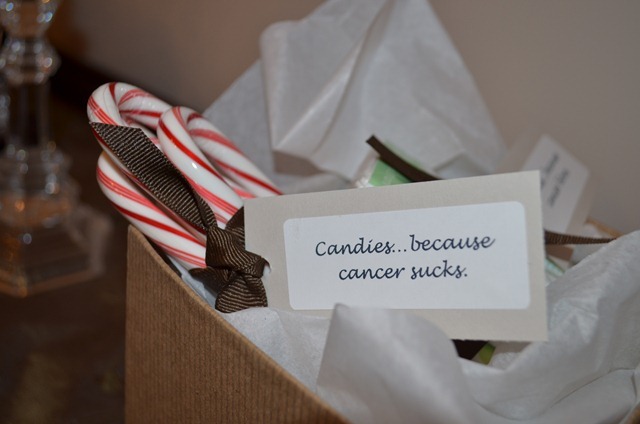 Hard candies – I don’t know what it’s like with other chemo drugs, but the ones I received (Taxotere and Cytoxan), one of them gave me a metallic taste in my mouth when I was being infused. And while chemo tends to mess up your taste buds as well, my favorite candies I brought with me to each chemo treatment were Werthers. Just my 2 cents. 😉 This picture is from a pre-Christmas care package I did (see a trend?). Water bottle – The nurses in the infusion room would always encourage me to drink a lot of water during infusions as well as the days following treatment. The idea is that you want to let the chemo drugs cycle through and do their thing, but then you want to flush them out of your system as soon as possible. So a good water bottle that keeps things cold and doesn’t sweat is an awesome idea. Such a simple idea, but not one people think to give freely. I was fortunate in that my husband came with me to all treatments and my time spent in the infusion room was “minimal” compared to most. But if someone is spending hours, even days, in the hospital, consider visiting with them. Come with ideas or things to pass the time with them…movies, stories to tell, games. Even though they will likely have someone with them at all times, it will be a nice change of pace and a nice break for the caregiver to have someone take the lead on passing the time. You can even check with the hospital to see what sort of foods you can bring. I can tell you from experience that hospital food leaves MUCH to be desired. How wonderful it would be to have someone come with something “normal” to eat for the patient as well as any friends or family they have sitting with them. Just keep in mind your friend may be tired, weak, depressed, experiencing side effects of toxins going through their body. They may not be the same, bubbly person you are used to being around. Just be there, understand, and care. If the family doesn’t have a regular housekeeper, maybe hire a maid service, one time or regularly. Or while visiting, offer to do some clean-up yourself. The trick here is getting your friend to accept the help! I know I would have had trouble with this one. Or if inside the home feels too intruding, offer to do things in the yard. One of my neighbors mowed our grass for us and that was a huge help to my husband, and while he wasn’t tired from chemo, he was tired from taking care of me. Are there kids at home? Offer to have them over for a playdate, take them to the movies, or bring them something special. Younger kids may not understand what is going on and may feel scared and confused. Any sense of normalcy for them would be a huge relief for mom and dad. I’m sure there are so many more thoughtful ideas out there that I have forgotten or haven’t crossed my mind. My disclaimer is that these are my suggestions based on what I went through. Everyone’s treatments are different. Everyone’s side effects are different. Everyone also handles this trying time very differently. But what I do know is that anything you give from the heart to show someone you are thinking of them will be greatly appreciated and a huge way to lift their spirits. Thanks for sharing Angela. Another gift I gave a friend going through chemo was an in-home pedicure. She was thrilled since she couldn’t go out to public places and really needed a little pampering! Such a great idea! Thanks Mel! I just love reading your posts! I will be saving this one as I recently found out a coworker has a tumor. I also would like to ask you if I may share this blog on my website centered around Random Act of Kindness and Gratitude? I have a guest blog section and I think this would be grand! Thank you so much! We’d be honored if you shared our post. I love the idea of your blog and will definitely be checking it often. Thank you sooo much for your advice and tips above. My fiancé Danny has stage 2 leukemia and is going through his treatment now. He is suffering badly from the side effects. Mostly being weak, tired and being sick a lot. The nurses at the clinic have given us different medications to control the vomiting but none of them are working. I’m at a loss as what to do, I really hurts me to see him so I’ll. Is there any advice you could offer please!?!? I know he needs the treatment, its the only thing that we hope will help him beat this disease but I don’t want him to suffer the way he is right now. Thank you for helping me help a friend. This is so important to those. Of us on the outside. You are very welcome. It means a lot to us knowing we could help even if just a little bit! I am lost and frighten for my Dad. Will be there with him. Just have no idea what to except. Denise – I am so sorry for the delayed response and so sorry about your fears and uncertainty. Please let us know how your dad is doing. Praying that all is well. Hugs to you! Thank you so much for sharing! Flying to Chicago today for 2 weeks to spend daily at the hospital with my dad. So sorry to hear about your dad, but glad we could help in a small way. Hi I have just gone through a mastectomy due to breast cancer, but I met this amazing women who has to have chemotherapy for breast cancer, which I don’t need and I would like to do anything I can to help her through this very traumatic time. Some of your suggestions have been very helpful and I only hope she can get through this as she lives on her own and feels very alone and isolated. I have only just met her a few weeks back in hospital on our treatment surgery day but feel I really need to be there for her and will do everything to help her. Thank you so much. I am so lost as to what to do. I have asked to be put on her driving list. My friend just started chemo and she has two children (13 & 9) Her husband is useless. I am going to put together a chemo bag for her. You have no idea how much this blog is inspiring me. I feel like now I know something I can do to make myself feel useful. I know I am being selfish but I really want her to know that I will be there for her. THANK YOU. I’m so glad this helped! I think the hardest thing for others is figuring out how to help! There is nothing at all selfish about it. You are a wonderful friend to care so much. A good support system is over half the battle! Hugs to you and your friend! Thank you so much for this, I am trying to find ways to be there for my mother-in-law who is interstate and starting breast cancer chemo soon. Thank you again. Thanks! I wanted a few thoughtful gifts….. for my brother-in-law…… that could be helpful …… things that could be appreciated without “just spending money” …….. we live quite a distance away….. I think this will be perfect!! I plan to also include a notebook for him to write dates/thoughts/questions & perhaps note cards & stamps. What fabric do you suggest for the bag? Thank you for the great article! My friend was just diagnosed with breast cancer in both breasts. It’s going to be a long haul, and your ideas will help.